The Real deal: Is Gareth Bale worth $120m? Just wait a minute. Am I the only one who is outraged by the amount of money Real Madrid are willing to spend on Gareth Bale? The latest reports suggest the Spanish giants are ready to splash a world record $120 million on the Welsh winger. Surely this is too much cash for a player who has yet to win a single trophy and has only truly enjoyed one world class season with Tottenham? Now, I have been around long enough to know there is no logic in football, especially when it comes to financial matters. However, it’s worth taking a closer look at this summer’s big transfer story from all perspectives, because it promises to run and run. Real Madrid don’t need Bale. As good as he is, Real already have enough attacking players in their squad. Right now, Bale’s natural position on the left wing is already taken by Cristiano Ronaldo. If that wasn’t enough, Los Blancos also have Mesut Ozil and Isco who can play on the left or behind the striker as a “number 10”. Real can also call on the services of Angel Di Maria and Luka Modric, two other top players who perform similar duties. You could be tempted to say that any team on the planet would want a great player like Bale. There is no doubt he is incredibly talented and has huge potential. As a matter of fact, the 24-year-old winger is coming off the best season of his career, scoring 26 goals for Spurs in all competitions. Some of those goals were spectacular and allowed him to pick up two individual accolades – the PFA Young Player and Players’ Player of the Year awards. However, if we have a closer look at his career, we find that he has never won a single trophy at club or national team level. Furthermore, he has only ever played one season in the UEFA Champions League, the competition Real want to win above everything else. As a matter of fact, if they had to go out and spend a lot of money on one player, I believe it would be better spent on a striker. Considering Gonzalo Higuain was sold to Napoli, Real would benefit from having another forward. Besides Karim Benzema, manager Carlo Ancelotti has no other proven goalscorer who can play in the box, so why not go out and spend $60 million or $70 million on someone like Luis Suarez? So what about Spurs? Most of their fans will be reading this and thinking that they would never want to sell their prized asset. However, if you got over $100 million for Bale, isn’t that good business? With that kind of money, you could go out and get at least two world class players. Who knows, as part of a deal for Bale, you could even get Modric or Di Maria in exchange, two proven internationals, who would walk right into the side. Plus, as great as Bale was last season, it is not guaranteed that he can perform at that level again if he stays at Spurs, especially if he isn’t happy. There have been a lot of reports out there that he wants to go to Madrid, so, if he is not allowed to leave, will he still give 100% day in and day out? In my opinion this deal will be done, and it will be done soon. Considering Real want Bale and Bale wants Real, it is just a matter of time before Spurs accept to sell the player. The fee will be outrageous, and when the dust settles, I will be thinking how and why the transfer world record was broken. Bale's performances last season were world class and players of this calibre are hard to find. Simple economics dictates that the transfer fee will be high, coupled with the fact that he is in the first year of a new contract. Bale can play in several positions, he wins games, is exciting to watch and there is no team in the world that would not want him. A staggering transfer fee is the only way Spurs could justify selling him. You have no understanding of the transfer market. Can Spurs really attract "at least two world class players" without Champions League football? Can they afford their price tags given every club in the world will know Spurs have just received $100m and will simply push up the prices? Can they afford to pay vastly inflated wages of those players? Do they have a stadium to build? Is Bale worth a lot commercially to the club in terms of shirt sales, brand building, and attracting class players that want to play with him? I wouldn't sell this season at any cost, unless Madrid want to wholly fund our new stadium. Bale needs to stay next year, help us get Champions League football, and then, if he still wants, leave for Madrid on just as much money as he would get now. No player is worth that much money. That's just outrageous. They are basically making fun of the fans who bring all the money in. Spending it on one player. Beh. It's a joke! This should be illegal. No player in any sport is worth this much money. This is just a disgrace. Its basically making fun of all the fans of the club who bring the money in. The fans should actually protest. It's a joke. The money could be spent on much much more. Bale is just a player. It should be illegal to put that high of a price on a player. I hate it when writers knock a player of a team sport for not winning championships, as if the quality of the team on which they play is irrelevant. If Bale goes to Madrid and wins the Champions Leauge and La Liga titles, will it be because he suddenly learned how to win in the off season? Of course not, it will be because he moved to a better team in the off season. Soccer is a team sport, and any team would love to have a player of Bale's quality. Now, whether he is worth this kind of money is a different matter, but Spurs failing to win trophies is kind of irrelevant. The author obviously does not understand that Bale will bring in at least $120 million over the stretch of time through ticket sales, jeresey sales, etc. If he is worth the investment, who cares how well he plays? Although, I venture to guess he will also play well. This is like saying Karl Malone did not deserve a large contract because he never 'won anything'. Please. This is overpricing gone mad. The trickle-down effect will have far reaching consequences. 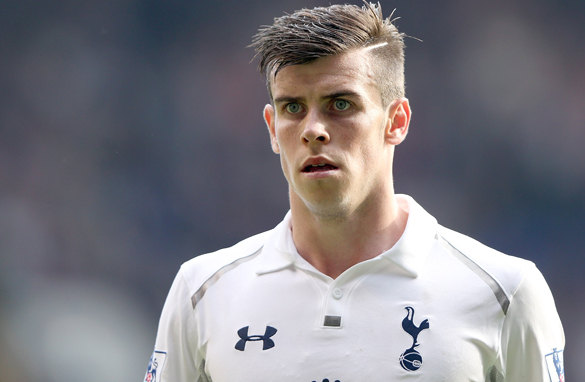 Tottenham should let him go as its Bale's dream to play for Real Madrid. No one is worth $120,000,000, regardless of what they do. That's more money than all their ancestors, combined, were able to earn, all through recorded history. It's also why I will never pay to see any professional sports. Just wanted to remind you about what happened to me when I was sold to Chelsea for £50mn. The pressure would lock your legs up like magic- you would find it extremely difficult to find the net for quite some time (haven't fully recovered yet – still not back in my Liverpool form...although some might argue that my performance at CONCAF against Tahiti was phenomenal ;)...don't let me blow my trumpet). Just make sure you know what you're getting into...might be a couple of years on a dry spell. Real might have no choice but to sell you to some rubbish team in La Liga Coca-cola Ch'ship. Goodluck mate. Let Real have it and waste their money... Real nowadays is catered for 1 man team in Christiano Ronaldo who don't pass the ball and tries to dribble everyone anyways. No good "teamwork-based team" can be formed with C Ronaldo. It makes all the other good players in the team under-utilized. That's why Man U unloaded him ages ago. He is not worth that money. His activities will not improve anything for vast majority of population of this planet. Getting 120mil for kicking ball from one corner to another corner? We as a species are flawed and this is a prime example of that fact. At 100 M Bales would have to score more goals than Cristiano Ronaldo to be even acceted in Madrid....at 120 M he would have to be Messi and Neymar da Silva!! bale is not even worth 60 million dollars so this football insanity should just stop. I think it's most foolish for Real to break CR7's transfer record on a player who sees CR7 as his idol and still expect to renew CR7's contract. Where will the money come from and how will it affect the dressing room especially CR7. Perez is just an idiot! I totally agree that Bale is not worth over $100 million and considering the depth Real Madrid have in their squad with the likes of Isco, Illaramendi, Di Maria, Ozil and Kaka to bolster the midfield, they don't need to splash the cash on him. If Bale comes, Ronaldo might not get to play in his position which might affect his play. Suarez would be a great signing! Bale is worth $25 million only and no more. He is injury prone. He may fizzle out. He may be Torreslike. So why waste!!! all that money on a single untested player when 120million people are dying becoz of hunger, sickness and wars. Luis is far better than bale. Bale's performance last year was brilliant and majestic. i always compare his goals to the 3-pters at NBA game. he carried the team all through the year and there is no doubting the fact that his offensive and defensive capabilities will strengthen Real MADRID. I want him to join real and add to the limited number of game changers and winners in the team. Ronaldo will not always have a great game and his one dimensional play will never break an opposing team with great resolve, so the addition of Bale will surely spice things up. finally, the competition will be tougher for Barca. if real can deal very well with the minnows and pretenders home and away in the league, they can now handle the el classico with all seriousness it deserves and limit the clearing and present danger of the merciless messi. 2. For El classico purposes: Neymar and Messi will want to prove the Catalunya dorminance but we nid to spicy up some things. We nid players that can die a little for the badge like Luise or Bale can. Mind you Luis has said already that he will sweat blood just to play for Madrid. Bale may not be able to bale out Real Madrid. After all is said and done, it' ll amount to, "too many cooks spoiling the brut". I think it is high time Real Madrid desists from this culture of – " we must buy at least one world class footballer every year". It is sheer egoistic! If Ancelotte harnesses properly the amount of talent he has on display, he can win any title available. The board of Real Madrid show learn to sign players based on necessity, not necesserily on pride. This is all about being seen as the biggest club in the world. "Pride goes before the fall". i think he plays very and he is one of the promises of Wales, he will fall as a glove in the real madrid's team, but no one today worth 120 million i think that real can think a little bit on this, because it will be a lot of money!!!!!! Lets just say he stays with Spurs one more year and they qualify for champions league or win prem league, maybe win europa league and Bale continues or improves his performances with 30 goal plus season ,what will he be worth then? 150-200 million euros? he has played in the champions league. Remember the hatrick at inter Milan??? poor sports journalism. real Madrid need bale or wants bale , or is it that bale need or want real Madrid , then some of these grumpy speeches about real will be answered. if getting Bale with that amount real will gain more than that amount why should real hesitate to buy with that amount . It is, after all, only fair to remember that Bale is a two-sport man.... he's a championship diver as well. Bale has performed fantastically for club and country for 3 years. He is never going to win an international trophy being Welsh and very unlikely to win a European or domestic tophy with Spurs. Is he worth that amount of money...yes. If Ronaldo or Messi were sold now you would be looking at $200 mil. The amount of money spent in soccer is ridiculous........but so it is in most sports. Just enjoy Bales talent. Real has no money, Spain has a huge unemployment and yet they can afford this luxury? Who is gonna pay for it? The nothern European countries I am afraid. This is really unbelievable, unacceptable and should be forbidden! !